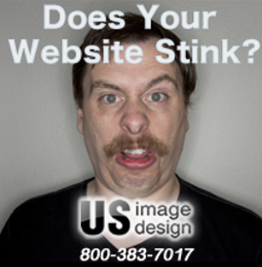 Does your website stink? Then it’s about time to start looking for a new web designer. If you have no idea whether your website stinks or not, then this article is for you. 1. How Does Your Website Look On Mobile Devices? Can your website fit comfortably – and beautifully – on any mobile device screen? Or does the content, graphics, and overall layout look crowded and unclear? If you’re website isn’t optimized for mobile devices like cell phones, and pad devices, then you can count on losing out on a lot of potential business. If your site isn’t mobile friendly… Then your website stinks! 2. Is Contact Info Such As Forms, Phone Number And Address Easy To Find? You can have the most engaging, innovative content any business could ask for. However, if there’s no way for your visitors to easily locate a way to contact you, you can count on losing out on tons of business, not to mention the amount of money you are losing from consumers bouncing in and out of your website. Contact forms, phone numbers, and an address for your business should be at the forefront of your website, so that customers can contact you immediately. If your contact info is hard to find… Then your website stinks! 3. Is Content Easy To Understand, Are Their Photos, Is It Too Much Content Or Not Enough? There’s no need to channel your best Ernest Hemingway when creating content for your website. Internet audiences want something straightforward, digestible, and above all else engaging. Moreover, images are a great way to break up content and further engages visitors. You need to have content and photos placed appropriately or people viewing your site will get discouraged. If your site looks like a jumbled mess, with bad photos… Then your website stinks! If you want your visitors to be part of your business, you need to invite them. A call to action encourages business and is also a great way to reiterate contact information and location. If your site doesn’t have call to action anywhere on your website… Then your website stinks! 5. Does Your Site Have A Portfolio Or Testimonials? You’re talking a big game, but can you back it up? You need to have a portfolio of proven expertise up on your website, along with testimonials that show your business is the best. If you don’t have a portfolio or testimonials on your website… Then your website stinks! 6. Is Your Site Social Friendly? You ARE on the big social media platforms (Twitter, Facebook, and LinkedIn), aren’t you? Reach a broader audience by engaging in social media, and make sure those accounts are easily accessible from your site. If you site has no way for customer to fine you socially… Then your website stinks! 7. Is Your Site Search Engine Friendly? Search Engine Optimization (SEO) is crucial in getting your website noticed. Websites built in flash or has no meta tags, such as keywords, title and description will have a hard time getting across to the search engines what the website is about. If your site is totally flash or has no meta data… Then your website stinks! Looking for a web designer because your current website stinks? Contact US Image Design at 1-800-383-7017. Get help with your website today. All web designer aren’t created equal.